Crystallography is a very unusual science in the landscape of gender equality, with strongly diverse beginnings, which are widely lauded. There have been many celebrated female role models, including two Nobel prize winners. Lonsdale, Hodgkin, Franklin, Megaw and Yonath are but a few of the distinguished women crystallographers in the field. It should be noted that some of this gender diversity stems from the very foundations of the subject: eleven of W.H Bragg’s 18 PhD students were women. However, how are we placed for the future? Is the IUCr upholding its pledge to provide congresses that are balanced with respect to gender and nationality? Is crystallography as free of gender bias as many of us assume it is? Is gender equality a given in our science? Unfortunately, it appears that crystallography has just as many issues as other communities. Conferences are the perfect way to get a ‘snapshot’ of a field so the IUCr’s triennial congress is a great place to gather statistics on the worldwide crystallography community. The proportion of female participants at IUCr congresses seemed like the obvious place to start. Given that statistically speaking women are currently less likely to study science than men, as well as the fact there are systematic barriers obstructing the career progression of women, it would be unreasonable to expect attendees to be 50:50. However, according to data from the Montreal 2014(*) and Madrid 2011 congresses, attendees were 36% and 35%(*) women respectively (data from Hyderabad 2017 were not available when writing this article). Data on the career stages of these individuals is not available, but if there were no barriers or obstructions we would expect to see these statistics reflected elsewhere in the congress, for instance in the statistics of keynotes and plenary talks. This is not the case. 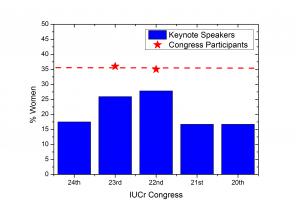 Figure of the statistics discussed in the article, presenting the % of women keynote speakers and % of women participants in the IUCr congresses. The red dashed line is an average of the two participant data points. Invited talks are a key indicator of prestige and it would be hoped that these would track the proportion of female participants. However, from the statistics presented in the figure above, it is clear there is a very distinct gap. The proportion of female keynote speakers at IUCr congresses has ranged from 28-17% over the last five meetings. For a scientist who was completely unfamiliar with the field, this disparity would be incongruous with the community that they would meet on the ground. The young scientists who are attending their first conference or the academic who is venturing into crystallography for the first time would get the impression that the science of women crystallographers is not worth shouting about. The final statistic to highlight is easy to verify. Plenary lectures, which are the highest indicator of esteem, were first established at IUCr congresses in 2008. There have been a total of 13, of which only one has been given by a woman: Ada Yonath. It is interesting to note that, while only a third of the male plenary lecturers are Nobel Laureates, the lone woman plenary lecturer is also a Nobel Laureate. Many studies have been done about impediments to advancement present for women in sciences; recently a study was able to quantify the bias present which underrates the competence of women, regardless of their actual qualifications (C. A. Moss-Racusin et al, PNAS, 16474–16479, 2012). The crystallography community is echoing the concerns which are being noted in other areas; the number of keynote lecturers do not seem to represent the number of women in the community which in turn means that fewer women are able to progress to ‘plenary level’ within their careers. This is clearly a big barrier to retention. Because there was no data available, we have not been able to dig deeper, and examine the challenges facing racial/ethnic minorities, especially women of colour, who are historically further marginalized within scientific communities. If we want to ensure there are the same opportunities for all then we need to understand why this happens. The biggest change is one that is almost too simple to be believed. It just involves a simple question when organising events or meetings. Everyone always considers the ‘Have I selected the best possible people for this session’ part of the plan, but there is a second half to this question that should be considered. ‘Have I selected the best possible people for this field, remembering that I have inherent biases that may skew my first choices?’ It is a subtle but important difference but it actively encourages you to challenge yourself. Within the setting of a conference, making sure a crystallography conference is inclusive is an important role for the organising committee, which should have a nominated officer who can report back to the IUCr executive on equity and diversity. In order for our community to progress more generally, the IUCr Executive Committee and future conference organisers need to acknowledge that the gender balance of invited speaker at IUCr congresses does not reflect the community at large, and subject this to their own review. As scientists, we thrive on data, and hence the more statistics on such representation that can be made available, the better for us all. There are numerous ways that we can look to make future IUCr congresses more inclusive, and knowing the statistics of our community will greatly assist how such schemes can be targeted. We should be absolutely clear: We are not advocating for the favouritism of women over men to make statistics look good. We are advocating for people to challenge their inherent biases. The authors would like to thank Jenny Martin for her comments on this article. A note: Since first drafting this post, the speaker policy for the European Crystallographic Meeting has been published, where they have taken an excellent and a forward thinking move to address the issues we have discussed here. We advise all that are reading this post to also read their policy http://ecm31.ecanews.org/en/speaker-policy-for-gender-balance.php . *A note on the data gathered for this post: The gender proportion for the 2014 conference was determined by the authors from delegates names, with 1464 male delegates, 524 female delegates counted and 224 undetermined (the proportion of the 2011 Madrid congress was supplied to us directly by from the organisers). The gender proportions of keynote speakers for the 2017, 2014, 2011 and 2008 congresses were also determined from delegate names, by the authors. We acknowledge that there will be human error in the methodology of determining a delegates gender from their name – and of course there are those in the community who will identify as non-gender binary. A few have questioned the value of this approach, of determining conference gender statistics in this way, but we would make the case that some data are better than none and that what we have gathered is enough to show that statistics should be gathered as a matter of course by the future congress organisers.